For Part III of Brunch Week, let's chat about Sam's Morning Glory Diner, a South Philly staple since 1997. QVF and I took some out-of-town friends to Morning Glory on the Fourth of July as our last meal before everyone headed home. Despite Philly having a reputation for emptying out on summer holidays/weekends, there were still plenty of locals waiting in Morning Glory's courtyard for a delicious brunch. 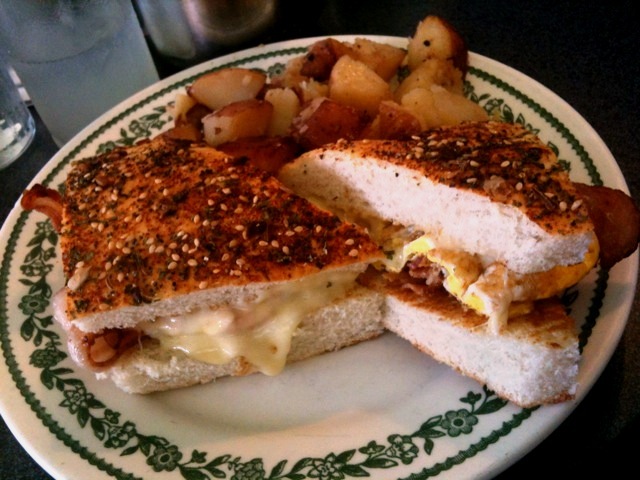 Morning Glory is a straight up diner, but with far better food and a more homely feel than any diner I've been to... and I'm from the diner mecca of North Jersey. Brunch offers all the regulars, some with a twist like Pecan Waffles and Challah French Toast with strawberry sauce, a few salads and a selection of irresistible frittatas. I've heard the Monkey French Toast is a highlight - challah french toast stuffed with caramelized bananas and mangoes, topped with caramel sauce and whipped cream. Hello. 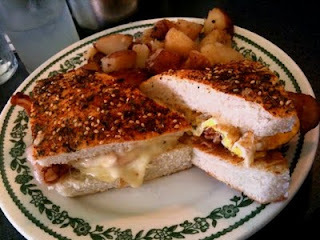 I made the very excellent decision to order the Focaccia Breakfast Sandwich. A simple fried egg n' cheese with bacon added, this was still no average sammie. The focaccia is a homemade staple at Morning Glory and a key factor to making this one of the best bacon, egg and cheeses I've ever had. It must be popular, because I saw a giant pile of foccacia behind the counter ready to be sandwiched. I would eat it again, right now. A few friends got the special frittata - which I recall had a lot of mushrooms in it - and loved them but they were definitely way too big to finish. Bring your best appetite. 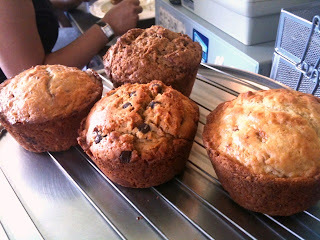 On the way out I got a peek at the homemade muffins on the counter too, and they looked pretty amazing. Next time. Supposedly the biscuits are great, too. As another South Philly hot spot, you will likely wait a while to get in on the weekends. At least Morning Glory has a decent-sized outdoor patio with tables and chairs to wait at. I was surprised to see they were just for waiting, not eating though. We probably waited a half hour, which isn't bad compared to the typical hour at Sabrina's. Plus they don't seem to care if you bring bottled water or coffee into the patio area from other nearby shops. Here's another tip: when you walk up, don't expect to find a hostess. Look for a clipboard near the door, and just go ahead and add your name to the list. They warn you that the counter seating can get hot, because Morning Glory's open kitchen is on the other side. The rest of the tables are typical diner style, tightly packed in a fairly small area but comfy and casual with some unique touches. The ketchup, for example, is homemade and served out of a wine bottle. The staff seemed a little frantic (it was packed, with more people waiting) so it was challenging to flag down the waitress for our check and to pay at the register. I've read other reviews that service isn't the best, but then again I never really went to diners for the great service, so it didn't bother me. P.S. it's cash only! All told, Morning Glory didn't need to blow me away with the best brunch ever - I was quite content with a casual, simple setting and solid meal after a long weekend with friends. I'd recommend it to anyone! 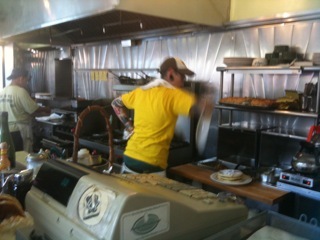 Cook was so busy I couldn't avoid a blurry, in-motion shot! to the writer - you may have meant to describe the atmosphere there as 'homey', not 'homely', which describes an unattractive person.... LOL. But, you are correct in giving this little diner the great review it deserves for its excellent food!! And, it has a hipster vibe to it, more than a 'homey' one, for sure.. can't wait to go back again for the wonderful frittata I had, with whole grain toast and home fries!! Also, fresh-squeezed OJ...Yum!! Thanks for the comment. I went with some homemade ginger juice and it was just ok, but I'd try to orange next. Good food if you can get staff to wait on you. Stopped going after being ignored on two consecutive occasions. The vibe I felt was wasn't hipster, more like, don't care that you came in and we'll get to you when we feel like it.